So I found these railing tubes on the side of the road with a free sign a couple years ago.Its really nice red oak or knotty alder in 3/4" thick. They've been sitting around my garage because I had no idea what to do with them. I finally got around to cutting them apart (which creates so much waste) and decided that our silverware drawer needed an upgrade since we got all new utensils at our wedding. Whomever made our drawers did a really crappy job, they were only like 1-5/8" deep, so I knew I could make more usable space. I first cut all my boards to 3 inches wide on my table saw. I then moved to my bandsaw, put up a temp fence and resawed the boards to 3/8"(ish). From there I moved to my planner to clean up the resaw marks and get them all perfect. The frame is 3/8" and the slats are 1/4". I opted to lap joint the front and dado the slats. I used my router table for the lap joint and my table saw for the dados. 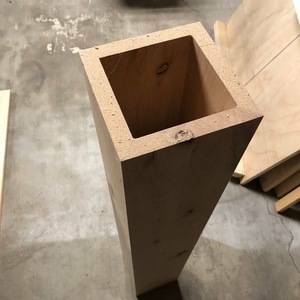 I don't have a dado stack yet, so I just eyeballed for the thickness. 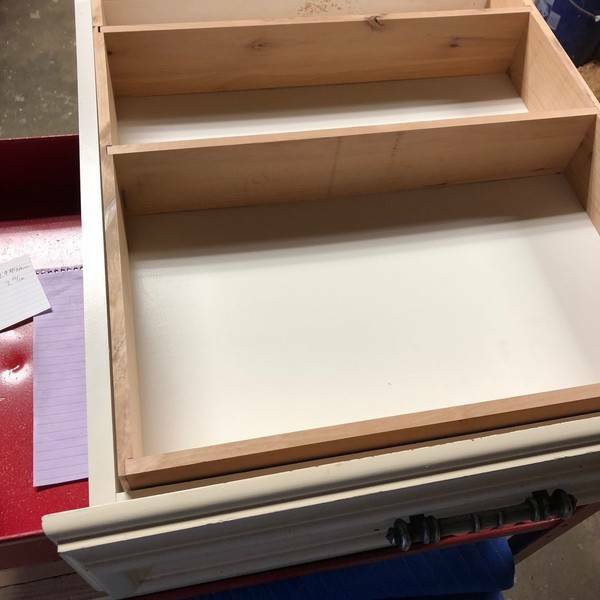 I did leave the frame long in the back to get rid of that unusable space in the back of a drawer where no one can reach. 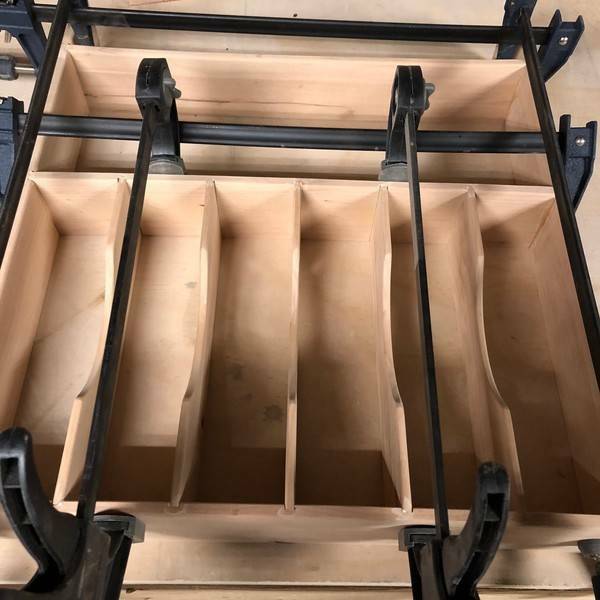 It fits snug in our drawer front to back, and side to side there is only about a 1/8" wiggle.Last year I made a cross cut sled for my table saw, so this was a piece of cake. Once I got all my pieces together and dry fitted everything it was obvious that the slats needed a bit carved out, so I tapped all the slats together, grabbed a paint can and drew a nice curve and headed back to my band saw. From there I glued it all up and then glued on a 1/8" bottom. Once all the glue was dry I used my hand router with a flush trim bit to make it perfect! After lots of hand sanding to get all the edges nice and smooth I then heated up my branding iron and made my mark. I finished it off with a few coats of shellac which is food safe, all natural. I had no idea shellac was made from bugs tho lol. Once it dried and I was able to put it in the drawer I sat down with a cold beer and admired my work! Now that the wife has 1 custom drawer, she wants the whole kitchen up graded.. back to garage! Happy wife, happy life! :) Nice work! Genius! 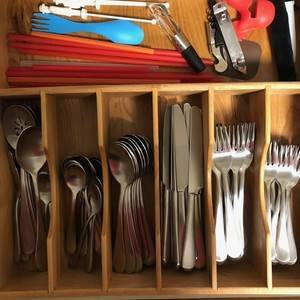 Thanks so much for the details and documentation on how to replicate it for our kitchens. 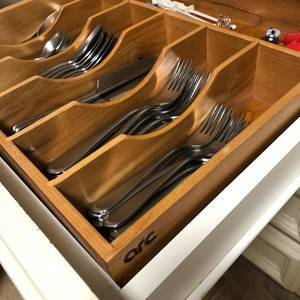 The Mrs. will probably expand the concept beyond drawers. Can't wait to see what's next! So I found these railing tubes on the side of the road with a free sign a couple years ago.Its really nice red oak or knotty alder in 3/4" thick. They've been sitting around my garage because I had no idea what to do with them. 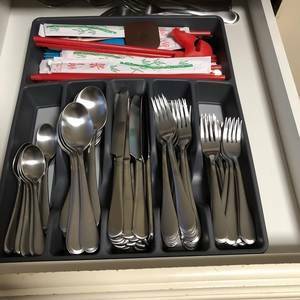 I finally got around to cutting them apart (which creates so much waste) and decided that our silverware drawer needed an upgrade since we got all new utensils at our wedding. Whomever made our drawers did a really crappy job, they were only like 1-5/8" deep, so I knew I could make more usable space. I first cut all my boards to 3 inches wide on my table saw. I then moved to my bandsaw, put up a temp fence and resawed the boards to 3/8"(ish). From there I moved to my planner to clean up the resaw marks and get them all perfect. 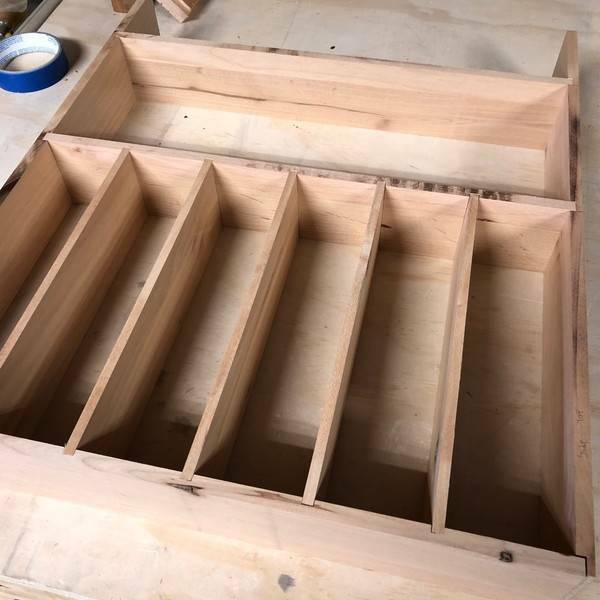 The frame is 3/8" and the slats are 1/4". I opted to lap joint the front and dado the slats. I used my router table for the lap joint and my table saw for the dados. 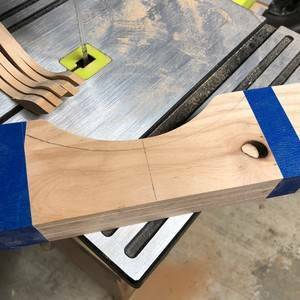 I don't have a dado stack yet, so I just eyeballed for the thickness. I did leave the frame long in the back to get rid of that unusable space in the back of a drawer where no one can reach. It fits snug in our drawer front to back, and side to side there is only about a 1/8" wiggle.Last year I made a cross cut sled for my table saw, so this was a piece of cake. 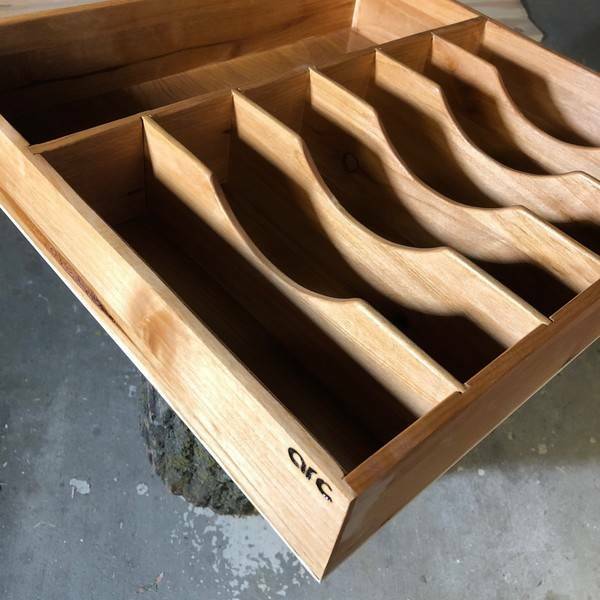 Once I got all my pieces together and dry fitted everything it was obvious that the slats needed a bit carved out, so I tapped all the slats together, grabbed a paint can and drew a nice curve and headed back to my band saw. From there I glued it all up and then glued on a 1/8" bottom. Once all the glue was dry I used my hand router with a flush trim bit to make it perfect! After lots of hand sanding to get all the edges nice and smooth I then heated up my branding iron and made my mark. I finished it off with a few coats of shellac which is food safe, all natural. I had no idea shellac was made from bugs tho lol. Once it dried and I was able to put it in the drawer I sat down with a cold beer and admired my work! Now that the wife has 1 custom drawer, she wants the whole kitchen up graded.. back to garage!